As you know, rogue sites can be very damaging to your company. They are often the answer that your franchisees use to have that web presence that’s so imperative nowadays when an “official” solution is not offered to them. Nonetheless, they affect brand compliance, cost your company money and they can misrepresent your business to potential leads. Let’s look at an example of a rogue site. To the left, you’ll see a screen caption of a corporate site with the layout, colors and information that this company needs. To the right, you’ll see a rogue site. Other than the logo, you can notice that there’s not a lot of similarities between the two. One has been carefully designed, and the latter looks like it was a cheap solution to an online marketing need. Keeping consistency in branding is very important to portray a trustworthy company to the clients. But what can you do to ensure or better guide your franchisees so that a case like the one stated above doesn’t happen to you? Lots of franchises have brand compliance guidelines. It’s very important because in it, every franchisee can find how to keep up with the branding and positioning of the company. Nonetheless, in this day in age it’s appropriate to take online marketing into consideration and with it, create some guidelines for your websites. People interact differently with sites than with prints and there needs to be some guidance on how these are going to work. How should your franchisees approach the visitors in their sites? Are they supposed to have a very formal writing style or a more casual and friendly manner? Should they write in active or passive voice? How should they refer to your business? Don’t take this for granted because a change in the tone and wording of a site can result in a totally different appreciation on behalf of the visitor. A big percentage of a site’s content is text so be careful of how your franchisees sound and make you sound. Plus, a disconnect between the verbiage in your corporate site and the one in a franchisee site can potentially throw a lead off. If you have a brand compliance manual, you may have already included a section where you go over the logo: the correct color, the right proportions, the usage, etc. But this is the single most representative piece of your company because it’s how people identify you. This is why, while many franchisees already know how to use the logo, it’s very important to let them know where to place it in the site, how big it should be, can it be animated, etc. 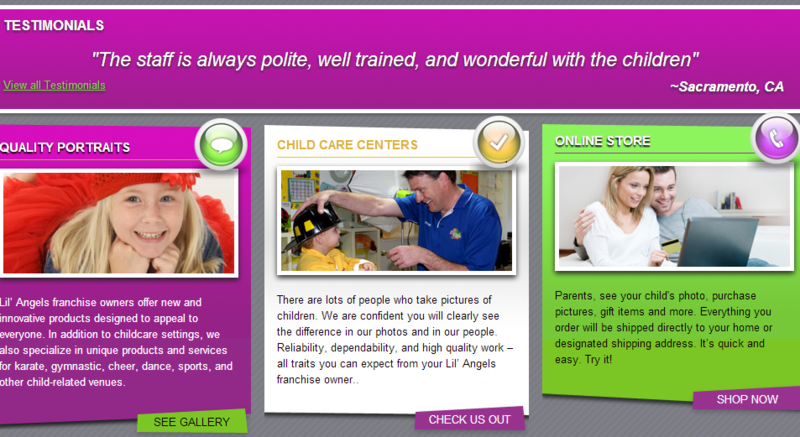 As a tip, we recommend that you tell your franchisees to place the logo on the top left corner of the site. While in print, the logo is commonly placed at the bottom right corner so it’s the last thing they see, remember that in a site, a visitor can scroll and go back and forth between pages so there’s no certainty that they’ll ever get to that corner. They need to recognize who you are as soon as they click into the site, so don’t risk it! Color can change the look and feel of your site. It can tell the customer what your site is about as soon as they click into it. Moreover, as previously stated, your company’s colors and logo still need to show through your site. By picking a set of colors that complement and accentuate your business’ branding, you’ll be able to give your franchisees some range to bring their sites into life. Remember that these are going to be everywhere: from the color of the text, the links, backgrounds, navigation menu, etc. Let’s get back to the example above. The corporate site uses a gray that help the bright colors in the logo and design, pop and be more playful and childlike. They represent a young energy and a fun place for kids to be. The rogue site, on the other hand, doesn’t use the colors in the same way. It looks pretty plain and not as inviting. This means that they aren’t representing the brand effectively. Typography is often overlooked but it shouldn’t be this way! The text’s font is another great way to further assure your company’s personality. That’s why it’s such a big deal in your logo! Choosing the right typography can create cohesion in your site, or totally take your site’s colors and style in a whole different direction. Let them know about the suggested fonts to use. Remember that in a site, there are titles, regular content, links, buttons, etc., and though it’s not recommended to use more than 3 fonts a time, by giving each element a specific typography, you create consistency and design. Maybe a font for regular text and titles, plus another one for buttons and links can work well for you. Just make sure not to overlook this step! Should there be people in them? Should people be holding the product? Are they animated? Should they concentrate in graphic design and cartoons? Black and white or color? Real scenarios over staged encounters? Should they include videos? There are a lot of questions to be answered but I would suggest to make some of the images customized to fit the local audience. It may be easy to include a snapshot of a single physical franchise for all of your franchisee sites but this takes away some of the purpose of having a local site. People want to see their neighborhood and even be featured in some of the site’s pictures. The layout is the structure of your page. You may not think too much of it but the way everything is organized can affect the story of your site. In this section, I would suggest to include some photos of how the layout should be: how the homepage should look, the type of design the internal pages should have, etc. Consistency is very important too. They can’t have the navigation menu on one side of a page and on the other on another page. For example, the elements on the header (the very top part of a page), should be a certain way and they should be in accordance with your site’s objective. Should the logo be there? should there be a call to action? What about the navigation menu? In the rogue site comparison, you’ll see that the neither the navigation menu or call to action are located in the header, like in the corporate site. Same thing for the footer: there needs to be some kind of consistency, not only within a site, but throughout the sites in a same business. Compare for yourself! This is a BIG one and is probably the most important thing to consider. As you may know by now, content is the fuel that keeps the site running. So it’s very important to ask yourself: aside from the “obligated” pages (About Us, Services, etc. ), what information should your franchisees include in their site? Remember that branding is key here so you just can’t let them talk about whatever they want in the franchisee site, you need to have some control over it. Adding real testimonials, updating images (according to the established parameters), including tips and tricks, among other things can be a great way to update content regularly in a site. Keep in mind that duplicating content is not the answer and get the ball rolling with some very precise ideas for content. Let’s take a look at the sample sites. The information that you include in your homepage is crucial because it’s (more often than not) the first impression a lead gets of your business and site! In the corporate site, there’s a call to action, phone number, testimonials (which are great for credibility) and a snippet of the company’s services. All of which are musts for a site! The rogue site, on the other hand, has no visible call to action and doesn’t give much value to the customer. This is another solution to brand compliance issues throughout your franchisee sites. Empowerkit is a tool that allows your franchisees to promote themselves online, while you are still in control of design, content and uniformity. With it, you’ll be able to guarantee brand compliance because you can oversee and manage all the key elements mentioned above from a master site. This way, you can make sure that your franchisee sites follow your branding guidelines. Furthermore, you can give your franchisees as much freedom as you want. With your consent, they’ll have the power to modify their local site with relevant information to their specific area. It’s known that customers are looking for local answers to their needs. This is why a compliant local site can increase leads and, ultimately, conversions. While a web brand compliance guide is important, with a tool like Empowerkit, you can cut off all that middle ground where you spend time developing a document that you hope your franchisees will read and understand. You won’t have to worry about the misrepresentation of your brand in local sites. The benefits of having professionally managed and uniform local sites can be many. As a franchisor you get a consistency and brand compliance. As a franchisee, you get a marketing tool that can lead more customers your way. And both have exactly what they want: better business. You can have control and give them control. You can have it all! Branding is certainly a powerful tool to exploit your business to its maximum marketing potential. Even though the franchise model can have its toll on it, there are ways to assure that your franchisees comply with your guidelines while still being able to deliver a local and relevant website. Be it as it may and no matter which path you choose to follow, you need consistency and your franchisees need local presence, so what are you doing to achieve it? Achieve Brand Compliance in Your Franchise With Empowerkit!